After having written a piece called "Heathrow´s 3rd runway - how to focus" in February 2012, it is about time to bring things up to date. ..... Of course, you can look at these things from a very narrow perspective, or if you prefer you can see a bigger picture which is more illuminating. The prestigious CAPA Centre for Aviation brings out analysises on a regular basis about different aspects of the airline industry. In the last year alone, on 19th May 2014 it produced a study on the progress of the arguments in favour of one or another option for new runways titled, "London’s Heathrow and Gatwick airports commence the next phase of Davies Commission runway battle." On 10th September 2014 this was followed up by another article titled,"Thames Estuary Airport dropped: a milestone reached in the eternal debate on UK airport capacity." Some specialised periodicals have been publishing articles about the runway expansion debate. Here is a selection from September 2014 to January 2015. Each headline itself tells a distinct story though each has its own link so that it can be read in its entirety. 29th August 2014, "Heathrow urges Boris to support bid for expansion"
1st September 2014, "Boris attacks ‘barbaric’ Heathrow third runway plan"
2nd September 2014 " 'Boris Island' airport plan rejected"
9th September 2014, "Majority of MPs back Heathrow expansion"
19th September 2014, "Gatwick airport gains public support for expansion"
2nd October 2014, "Birmingham airport backs Gatwick bid for second runway"
8th October 2014, "Business leaders criticise Lib Dems for airport expansion stance"
3rd November 2014, "Willie Walsh: ‘No business case’ for second runway at Gatwick"
7th November 2014, "Heathrow warns of losing top airport status"
11th November 2014, "Heathrow and Gatwick plans to cost billions more than forecast"
11th November 2014, "Public back airport expansion in south east, ABTA study finds"
20th November 2014, "Gatwick warns of 'capacity crunch' after record results"
1st December 2014, "Heathrow to extend property compensation scheme"
1st December 2014, "Regional airport chiefs back Heathrow expansion"
3rd December 2014, "Heathrow CEO ‘sorry’ over runway promise"
20th January 2015, "County council opposes second runway at Gatwick"
1st September 2014, "Address UK air capacity 'ticking time bomb', says CBI"
2nd September 2014, " Public urged to speak out on airport expansion"
22nd September 2014, "Small businesses 'back expansion of Gatwick' "
30th September 2014, "Osborne hints at speedy decision on airport capacity"
3rd October 2014, "Gatwick pushes case for second runway at regional roadshows"
27th October2014, "Branson accuses politicians of being 'cowardly' over Heathrow"
28th October 2014, "British business urges backing for Heathrow expansion"
3rd November 2014, "Potential Conservative party split emerges over Heathrow expansion"
3rd November 2014, "Environment as important as economic impact of airport expansion, finds YouGov poll"
12th January 2015, "Heathrow and Gatwick claim record performance in 2014"
19th January 2015, "Gatwick unveils 'low-risk' two-runway plan"
29th January 2015, "Abta calls for new runways at both Gatwick and Heathrow"
21st September 2014, "Gatwick eyes point-to-point routes for long-haul growth"
21st January 2015, "UK Needs Quick Decision On New London Runway"
This blogger thinks it unnecessary to comment on each article. Readers can absorb what is written and come to their own conclusions. Sufficient it is to say that each person, grouping, poltical party or administrative area is pushing its own agenda for its own reasons. They do not necessarily reflect this blogger´s. The most significant point to note is that mentioned on 12th January about an increase in traffic at both Heathrow (to 73.4 million passengers - up 1.4%) and Gatwick (to 38 million passengers - up 7.6% ) in 2014 compared to 2013. The problem about the need for expansion of capacity will not go away. 1-There is a big demand for more runway capacity in the South East of England. 2-More runway movements mean more flights into one, two or more, or all the airports in the South East region. Denying that is ignoring the evident. There is a demand and it has to be satisfied one way or another. 3-There are arguments both in favor and against the expansion of one airport or another. 4-The preferences for increasing the capacity of one airport or another is, many times, the ability of the politicians to convince people to their way of thinking. 5-More runway capacity means more flights, which mean more point-to-point or transfer passengers, which mean more economic benefit for the regions, the airports and the principal players at the airports. The more flights, the more likely the increase in connections to various destinations. 6-the country as a whole benefits, not just the South East region. 7-If no new runways are to be built at Heathrow or Gatwick then a new site has to be chosen. This means Luton or Stansted. Luton is the better situated airport but presents difficulties in construction - but nothing like an Estuary airport. Stansted would be the prefered solution for many in government or the Civil Service - as it has been since the early 1970s. However, with respect to the rest of the country it is out in the boondocks, difficult to reach and needing an excessive investment in infrastructure. Most of this infrastructure already exists at/to Luton. 8-Any such commitment to a "new site" implies a commitment to a new 4 runway airport - something which is not necessary with the expansion of both Heathrow and Gatwick. 9-The choice of Luton as a new 4 runway airport could well mean the reduction, or even closure of Stansted. The choice of Stansted would well mean the closure of Southend and possibily Luton. Both choices mean a reduction in alternatives. 1- Limiting the number of flights at Heathrow or Gatwick airports does not mean a total reduction in flights in a region. 2-Can the demand for more flights be satisfied by replacing Heathrow flights with Stansted ones, or Gatwick flights with Luton ones? This is just wishful thinking. 3-Many people like to think that the unused capacity at regional airports can be used to satisfy demand. In certain instances this might well be the case. However, it is not true in most cases. I do not hide behind the decision of British Airways(BA) to pull out of UK regional airports to justify the fact that there is no demand into and from the regions to warrant onward flows to long distance destinations. I honestly think that there could be a demand but BA is not interested. That then becomes a self serving argument - no in-put therefore, no out-put, no in-connecting services therefore no outgoing services to North America or Asia --- even if the demand had been shown to exist before. 4)- Any meaningful descision can be put off/delayed to another Parliament.That is just sweeping the problem under the mat. 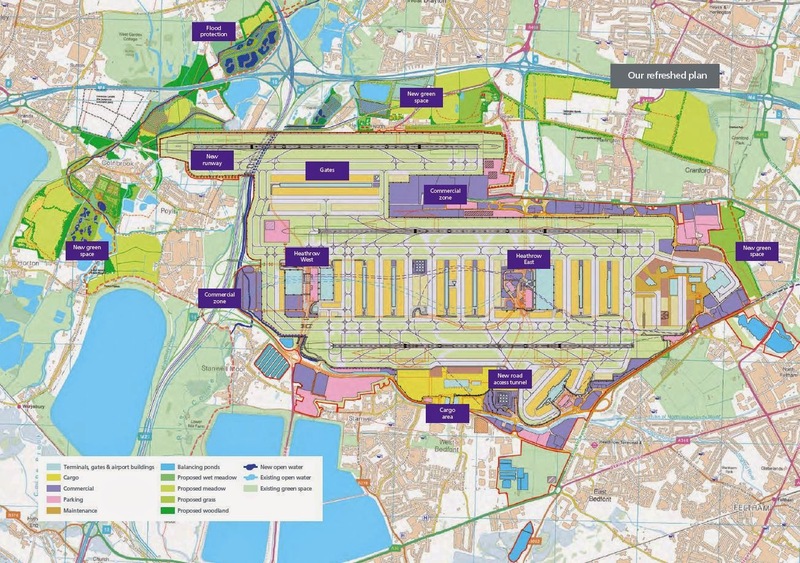 5)- Luton cannot be developed as a 4 runway airport. This is false since there is sufficient space between Luton and Harpenden to fit in 4 parallel independent runways which would not affect either town with overflying.The ground itself needs leveling but the work itself is far less than any envisaged on the construction of an Estuary airport. From this point we can develop the argument to include many differing opinions. This blogger has expounded on this issue before as stated so it is not necessary to repeat all the same arguments in detail. Considering one aspect, extending Heathrow´s runways westwards towards the M25 can help in the issue of noise reduction.The northern runway can be extended 900 meters towards the M25 while the southern runway can be extended 1300 meters. This means that noise pollution over West london can be mitigated to some extent since the aircraft can be landed that much further down each runway so eleviating the noise problem over extensive areas of West London. Add to that the possibility of increasing the angle of descent for the landing aircraft then the height at which the aircraft fly into Heathrow (or Gatwick) can be increased to a fair tranch over the built up areas - the higher the approach the lower the noise. Extending the runways further west over the M25 motorway and even over the reservoirs west of the motorway is a possiblity but would be ridiculously expensive and unnecessary. If measures can be taken to extend the runways westwards towards the M25 thus enabling aircraft to land further along each runway then the noise issue can be mitigated. However, combine that with the improvement of aircraft and engine design (which has been evident over the past decades) then there can be a real reduction in noise pollution. If then you go the one step further to legislate that ALL aircraft entering or leaving from Heathrow (or Gatwick for that matter) have maximum permitted noise levels, then you can ensure that the reduction in noise levels over West London (or Crawley in the case of Gatwick) is real and substantial. The fuel pollution, i.e. CO2 or other toxic emissions, is limited by improvement in airline and engine technology. Over the years the emissions have been reduced to much lower levels so as to be more acceptable. A Boeing 787 does not have the same emission levels as a B767 or B757. An Airbus A380 or A350 does not have the same level of emissions as a B747-400 or an A340. These new aircraft provide a lower level of noise and pollution not seen before. Quite frankly, it is really ridiculous to say that the effects of aircraft movements over any given area are the same in 2015 as in 1985 or will be in 2030. That is an ostrich approach. This blogger believes that a third runway at Heathrow and a second runway at Gatwick can both be built to solve the shortage of runways in the South East of England. They both would mean years of investment but not from public money. They should be permitted on the basis of a reduction in aircraft noise, measurable, verifiable and, if necessary, sanctionable for excesses. The same criteria would apply for toxic emissions. The fact that the aircraft landing and taking off from Heathrow and Gatwick had to conform to a limit of 55-57 decibels, or whatever were decided, together with engine emissions of xxxCO2, could make the constructuion of an extra runway at each airport viable. Applying these reductions for all operations over two years gives time for the airlines to adapt (previously I said a generation but now I reduce the time limit because the roll out of the new aircraft will be faster than originally thought - so in effect since the initial idea was proposed until its implication a generation will almost have past). Maybe the British airlines should lead the way with European, American, Middle Eastern and Far Eastern airlines following. Then the "poor neighbours" could follow. These rules applied to Heathrow and Gatwick would mean a big change in flying patterns. Applying them later to Luton and Stansted would help redistribute the traffic into/out of London. A third runway at Heathrow does mean a new terminal. This would be situated over the road and rail tunnel out from the terminals 2 and 3. It might even be called Terminal 1(previously I called it Terminal 6) to replace the previous terminal which is due to be taken down. Then it would have a direct connection to the Heathrow Express services and the Crossrail services (as they will then be) to the rest of the airport and into central London. Having a terminal north of the Bath Road does not mean there would be any necessity for aircraft to cross over the northern runway to gain access to any terminal. The best solution would be for all flights out of the (new) terminal one to connect to the islands and near connections. By this I mean Ireland and all the islands of Great Britain, plus others such as The Faroes, Iceland, Malta and even the Benelux countries, without excluding others. I mean all flights so that no airline or alliance is affected negatively. That way BA (oneworld), Brussels Airlines(Star Alliance) and KLM(Skyteam) would be equally affected. This is what was suggested in the previous article in February 2012. These headlines link to articles about all of London´s main airports and the increase in passengers year on year at each. Such is the reflection of an improving economy. All well and good, but the worrying part is the delay in deciding on runway expansion in the south-east. This information surely illustrates the need to take decisions now and not after the next election. We are a victim of our own success. We do not want any fudging. Let the government lay down (strict) conditions for runway building, then let both Heathrow and Gatwick get on with the job of building the extra runways at both airports with their own funding. Not one but two runways are going to be needed by mid century. Cannot we anticipate demand for once? The analysis provided by the airline site anna.aero on 21st January 2015, provides some interesting comparative information about both Heathrow and Gatwick. "....It’s pretty obvious to anyone that both airports are clearly running close to maximum capacity and both are highly vulnerable to disruption (such as sudden bad weather or an operational emergency). An additional runway at both airports would considerably help with reliability as well as creating opportunities for significant traffic growth, and benefits to the UK economy of somewhere around a whopping £300 billion ($500 billion). To get this figure we combined the Airport Commission’s estimates of the economic benefit of each runway – a total exceeding £340 billion – and ‘slightly’ discounted the total to account for overlaps – in truth nobody knows what the actual figures are, but it is safe to say the benefits would be an absurdly huge boost to the UK economy and competitiveness, were any political party able to explain it to the electorate." This blogger supports this view wholeheartedly. Now on 3rd february 2015 the last chance to provide evidence for consultation presents itself..